After reaching far out into the universe of Prog and Avant-Garde with Merkur, Klabautamann from Bonn, Germany, astound the tended listener once again and take no prisoners this time. With The Old Chamber, the band decided to take a few steps backwards into the realms of pure frozen Black Metal atmosphere once again. A mid-paced riff in the style of Enslaved starts what is to become one hell of a ride through all aspects of classic Black Metal. The features that made Merkur such an ambitious and demanding record were scrapped in favor of almost catchy (well… kind of…) and more epic sounding songs. The guitar work of Florian Toyka (who also plays drums in Valborg and Woburn House) and Tim Steffens (also on vocal duties) leaves nothing to complain about. Mighty riffs and cold melodies interlink in order to form a wintry and chilling entity. Piano and clean guitar sounds blink at some occasions, but are more or less restricted to interludes. Punchy drumming by Patrick Schroeder provides a strong groundwork. Never drifting to simple Thrash Metal patterns whenever he shifts into doublebass-mode, he keeps the cymbal/snare beats at pounding mid-tempo while maintaining the epic Bathory style that I have come to adopt on their first (and up to now only) full length. The recording circumstances of the album become almost tangible, as it was mainly tracked during the winter of 2010 at a cottage within the snowy woods and mastered at Soundsight Studio on analog equipment exclusively. Once again, a painting by John Bauer was chosen for the cover (check out a gallery with some beautiful works here). 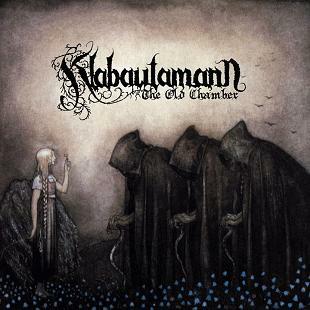 With The Old Chamber, Klabautamann deliver a great record to herald last cold and dark winter days of 2011! This entry was posted on November 11, 2011 at 2:54 pm and is filed under Reviews with tags Black Metal, Zeitgeister. You can follow any responses to this entry through the RSS 2.0 feed. You can leave a response, or trackback from your own site. An outstanding share! I’ve just forwarded this onto a friend who was doing a little research on this. And he in fact bought me dinner because I found it for him… lol. So let me reword this…. Thanks for the meal!! But yeah, thanx for spending the time to discuss this subject here on your site.